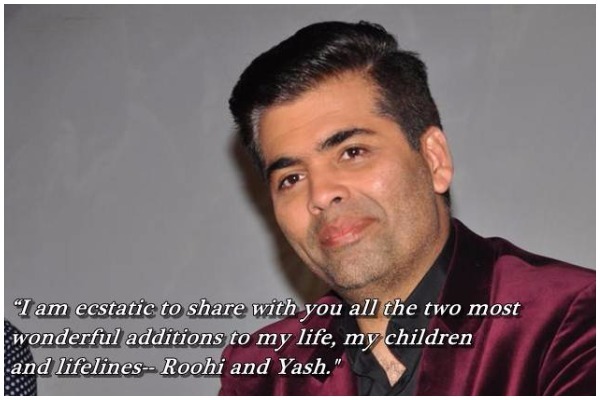 Karan Johar Becomes Father to Twins- Yash And Roohi Via Surrogacy, Celebrities Shower Wishes! Bollywood filmmaker Karan Johar shared very surprising and happy news on Sunday morning. The director took to twitter to express his happiness on becoming a father to twins through surrogacy. Yes, you read that right! After Tusshar Kapoor, Karan Johar has taken the way of surrogacy and is now a happy father to twins (a boy and a girl). The director has named his son Yash (after his father, late filmmaker Yash Johar), and daughter Roohi (a rearrangement of his mother’s name). In the post, Karan took to twitter and shared that he feels ecstatic and enormously blessed to be a parent. He also thanked the lady who gave birth to the babies and doctor for his guidance and support for the same. The babies were born at Masrani Hospital in Andheri, Mumbai, in February where Shah Rukh Khan’s third child AbRam was delivered also by a surrogate mother. The birth registration with the public health department of the children mentions Johar as the father. Well, Karan Johar had always expressed his desire to be a father and finally, the dream has come true. In fact, in his autobiography, The Unsuitable Boy, the director has mentioned that he always wanted to adopt a child or have a surrogate child. Soon, Bollywood celebrities Alia Bhatt, Varun Dhawan and others took to twitter to shower blessings for the newly born babies and wished Karan Johar on becoming a father. Glad u took my advice seriously @karanjohar Best thing to happen to you.. n theyll b the youngest people you hang out with so all's good ? Many congratulations to Karan Johar! Also Read: Koffee With Karan 5: Kapil Sharma’s Confession of Gate Crashing SRK’s Party to Taking a Dig at PM Modi!